Police crime figures updated and there's not much to purr about! The 2018 data is now in and it is showing that recorded cat theft has risen by a shocking 34% in the past year, making the overall increase 114% since 2015. The big question is: how much of this increase is due to some police forces upping their game by recording these crimes and how much is it a reflection of the cat theft picture? 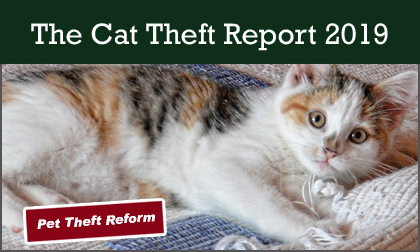 Why the need for a Cat Theft Report? Very little primary data has been gathered about the extent of the theft threat for cats and our feline companions were being left out of the debate as a result. It seemed to us that if we were ever going to be able to sharpen our claws when it comes to legislation this needed urgent addressing. The Cat Theft Report 2019 is the result of data gathered under a Freedom of Information request to all UK police forces, covering the period 2015-2018 and aims to get the theft of cats under scrutiny alongside their canine friends. The figures make for sobering reading. Do the police take cat theft seriously? Given that the numbers recorded by police forces overall are dubiously low, the obvious answer to this question is a resounding, ‘No’ - not seriously enough! One of the aims of this FOI request to UK constabularies was to establish whether our police forces were recording cases of cat theft and whether there appeared to be any consistency in process and policy. What the results have shown is that there certainly seems to be a wide discrepancy: how well did your police force do? Our commendations go to the Metropolitan Police Force whose figures represent nearly 18% of the total number of cat thefts recorded in 2015-18, West Yorkshire at almost 9% and Kent at just over 7%. 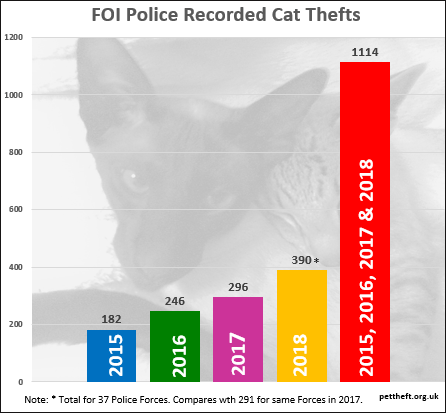 Examining the data further, there are forces who recorded no cases of cat theft in a whole year – and some for consecutive years. Are they really crime free zones? West Midlands Police, for example, recorded only two cat thefts over the four year period. As the second largest police force covering Coventry, Birmingham and Wolverhampton, we will leave it to you as to whether you are tempted to question the integrity of the recording process and whether this is likely to be a true reflection of the number reported. Are the regions with higher numbers cat theft 'hot spots', or is it that these constabularies take this crime seriously and record data properly to give a true picture? We expected that some forces genuinely take this crime more seriously than others and hopefully by requesting these figures it will prompt better future records. It is important to note that we only have information on the reporting of cat theft. If two or more cats were stolen at the same time this data doesn't account for this. A cat may have nine lives, but are any of them valued as they should be? There are some important issues highlighted here. *North Yorkshire Police gave us their figures on April 1st 2019, after the graphs were made. Their data will be included in next year's figures. "The total number of reports where a cat is recorded as ‘stolen’ in 2018 was 3". N.Yorks Police. Why cat theft must be taken seriously. 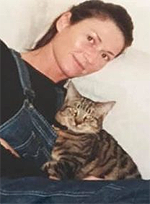 Cat theft victim Toni Clarke was devastated when her pet mysteriously disappeared after a courier driver left at her property during the summer of 2013. 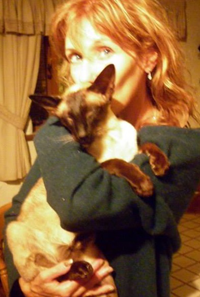 As soon as she noticed her cat had gone, she immediately reported the theft of her Siamese cat 'Clooney', but how seriously did the Police take her plea to get her family member back? "The reaction of the policeman answering my call could only be described as instant, disinterested dismissal, citing a cat’s 'right to roam' and that they were in a separate category due to this well-accepted, nomadic instinct. I tried reporting Clooney's disappearance as a theft again a few weeks later when I was utterly convinced there was no other explanation. I had spent every hour for weeks searching, putting up posters, delivering fliers, door knocking, walking, calling, crying.... He had quite simply vanished. And despite having employed the services of a tracker dog on two separate occasions who had found no trace of my boy, the answer was still a heart-sinkingly definitive, "No". Unless there was concrete proof, no Crime Reference Number would be issued. Despite reporting Clooney as a potential victim of pet theft twice to Norfolk Police, he remains unrecorded on their statistics of theft. This is tough to accept. My experience throws a huge question mark over the integrity of police data and their consistency across Forces in recording what people are telling them. 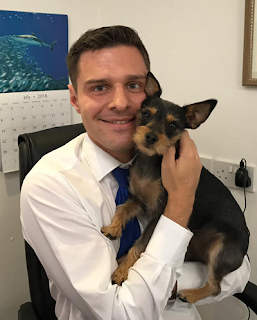 Owners' reporting of cat theft is distinct from, and shouldn't be confused with, police recording of pet theft crimes; the figures could paint an entirely different picture as my experience shows. It is clear from the wide discrepancy in numbers documented across the forces, with some recording zero year on year such as Lincolnshire, Durham and West Midlands, that this could just as easily reflect the cold spots of police interest as it does the hot spots of cat theft crime. Many Forces clearly take the theft of our felines much more seriously than others, and these Forces are to be commended. But we need consistency across the UK on their policies and attitude." Does a cat's 'right to roam' give people a right to keep and the police a right to dismiss your claims of theft? No! Keeping a displaced pet without making reasonable efforts to find the owner is 'Theft by Finding' and you can be charged. If you find yourself engaged in an ownership dispute or feel that you have rational cause to suspect that your cat has been stolen, don't be fobbed off by the police with this commonly-held view. Except in law we do! Cats who wander are legally the property of the original owner. Are valuable cat breeds being targeted? Who steals cats and which breeds are most at risk? Pedigrees have been targeted for resale or particularly for breeding. Pedigree breeds are distinctive and easily identifiable, making them attractive targets for thieves, especially when you consider that kittens from Bengals, Siamese and Persian along with other desirable breeds, can sell for upwards of £400-£500. Neutering your pet is the best way to protect them. Consider having their tag engraved with ‘neutered’ or ‘spayed’. Cats are stolen for many reasons but in many cases it is 'Theft by Finding'- a criminal offence where someone assumes possession without taking reasonable measures to find the true owner. Ownership disputes can also occur when couples part or housemates separate. There have been incidents where an ex-partner has deliberately taken a cat as an act of revenge. Which Forces have acted on Cat Theft? Which are the Forces to be reckoned with when it comes to prosecutions and cautions? 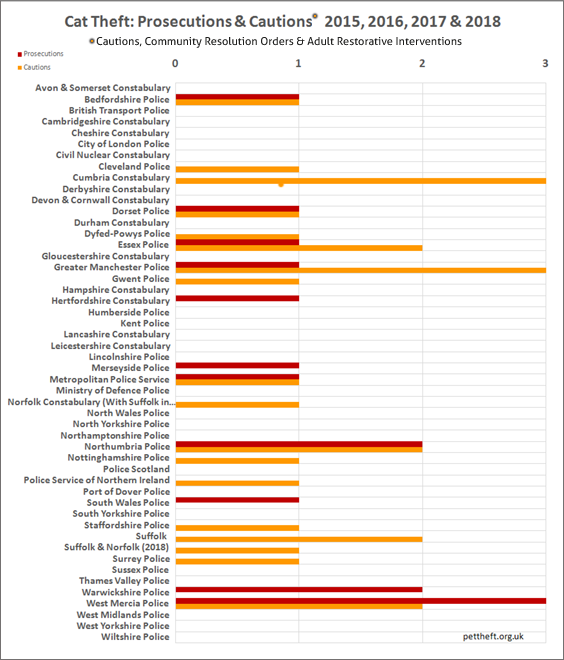 This data is especially important in highlighting which constabularies have taken this crime seriously. Just 1.3% of all recorded cat thefts resulted in prosecutions (2015-18). Almost half of the police forces who provided data have failed to prosecute a single case of cat theft or issue a police caution over the entire four year period. This looks bleak enough as a deterrent to stealing a cat, but when the figures are analysed for trends it’s a deteriorating picture. 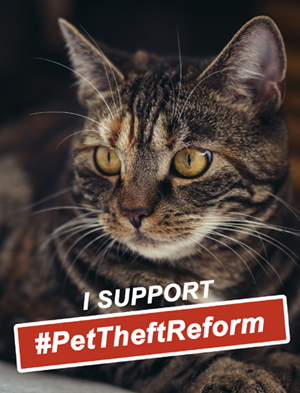 In 2015, 3.3% of cat thefts resulted in prosecutions. By 2018 prosecutions across all the forces had plunged to just 0.8% of all cases of cat theft – and these were all attributable in this year to just one police force, West Mercia. This significant decline in prosecutions needs to be set in the context of an increase in recorded cat theft crimes of 114% over the same period. Do these huge differences in recorded cat theft figures suggest that there is a marked differential in recording criteria and will some forces only ever give a Crime Reference Number in the presence of very persuasive evidence? An analysis of the data would indeed seem to support this lack of uniformity in policy. 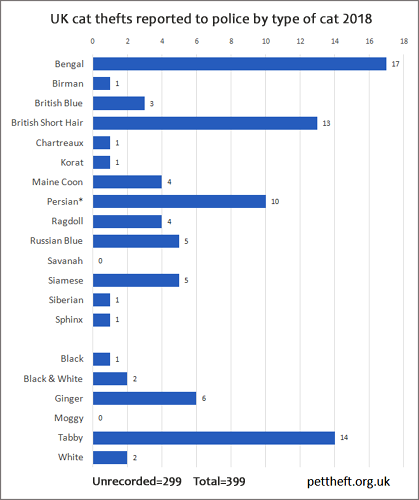 The Metropolitan police force are top-of-the-league recorders of cat theft by a runaway margin (197 cases 2015-18), however, when it comes to action, their offenders seem to be slinking off… Just 1% of all these cases were prosecuted or cautioned. Cumbria, on the other hand, recorded just 6 cases of cat theft in the same study period, but their record on issuing cautions was 50%. "Well done to the constabularies who have brought prosecutions. The figures show there has been a total of only fifteen prosecutions in four years. The cautions would suggest that the suffering of the owner is not being considered. The theft of a pet is life changing so a 'slap-on-the-wrist' caution is not the strong deterrent needed to cut this crime. Unfortunately, the value of the stolen 'object' is the deciding factor when it comes to punishments.". Richard Jordan, Pet Theft Awareness. Stolen V Missing: Police criteria for recording a crime - is there a uniformity across the forces? What criteria do constabularies use for recording a cat stolen as opposed to missing and are your chances of having your concerns taken seriously dependent on a police force’s formal policy? Could it even come down to the personal attitude of the officer? We asked each force this crucial question and what came back was extremely varied and somewhat perturbing. Many of the constabularies cited the 'Home Office Counting Rules' on whether or when to record a crime. Essentially, this is determined on ‘balance of probability’ that a) the circumstances of the victim’s report amount to a crime as defined by law and b) there is no credible evidence to the contrary immediately available. We can probably conclude that geographical location will influence whether your claim for being a victim of cat theft crime will be recorded and given that all-important Crime Reference Number. Insist on a Crime Reference Number! DogLost.co.uk also reunites cats with owners. Their founder Jayne Hayes agrees that some police constabularies might be letting cat owners down by not recording cat theft, "We have over 3,000 cats registered with us and have only THREE cats have been issued with a CRN number as stolen!". Pet Theft Awareness suggests that if at first you are refused a CRN then you are persistent and insist on getting one. You can even register a complaint if your claim is not taken seriously. What Should Cat Owners Do? Establish who legally owns each pet. Have plenty of photographs, especially showing any distinguishing features. Every time you visit your vet ensure the microchip is checked. Theft by Finding is a crime. If you find a stray you must take reasonable action to find the owner. Be aware of any local hot-spots of cats going missing. Share information. If you are a cat theft victim insist that the police record it as a crime. 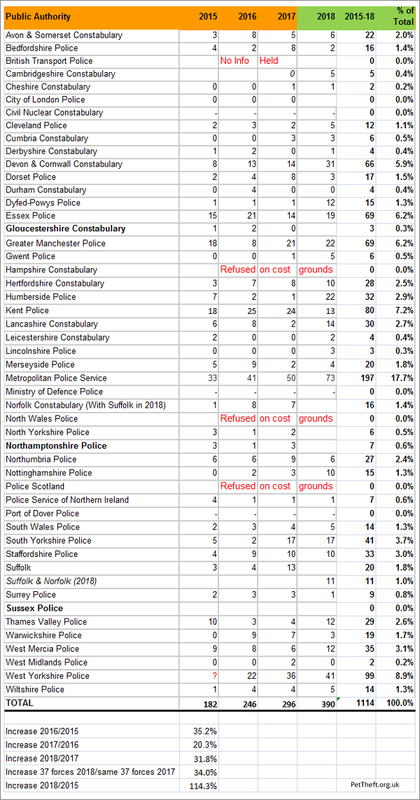 As you can see from the results some forces are better at recording thefts than others. If at first you are denied a crime number please explain you require it and challenge the decision until you are issued one. Wayne May of DogLost explains "We're getting an average of 90 cats each month registered as missing or stolen and this number has been increasing year on year. Due to the nature of cats, it's hard to ascertain actual thefts.". DogLost.co.uk is the UK's largest service for missing / stolen and found pets. Any animal can be registered and their service is free. Campaigner and dog theft victim Debbie Matthews adds: "We are grateful to Pet Theft Awareness, our partners at Stolen And Missing Pets Alliance (SAMPA) for working on Cat Theft figures. The way police categorise Pet Theft varies and the same issues arise for both dogs and cats, although we have the added problem with cats as they have the right to roam and they will often have several homes they like to visit! To members of the public we ask you to ‘think lost’ when you see a stray cat or dog, they may be someone’s beloved pet. Please report to the local animal warden and try to capture them and take to the vet to be scanned for a microchip. Theft by Finding is a huge problem and estimating how many pets have disappeared this way is impossible to guess. Will pet insurance companies offer any help in finding stolen pets? “The Insurance Emporium support the important work being done by Pet Theft Awareness, highlighting significant issues surrounding cat theft. Our policies recognise that cats do unfortunately go missing, whether by deliberate theft, theft-by-finding or because the cat has gone roaming. We recognise that the devastation of losing a beloved cat is the same for the cat’s owner whatever the cause. The Insurance Emporium donate money to the Pet Theft Awareness campaign for policies taken out from this link. Please help them support us if you requite pet insurance. What is the purpose of this Cat Theft report? Our aim is to encourage all authorities to understand that cats can be, and are being, stolen. To take it seriously it should be recorded properly. It is difficult to conclude much from the data but in a few years' time some patterns might emerge. Praise must be given to all the forces and police personnel who understand that cats are family. We'd like more understanding and action for victims and through perseverance we hope this can be achieved. 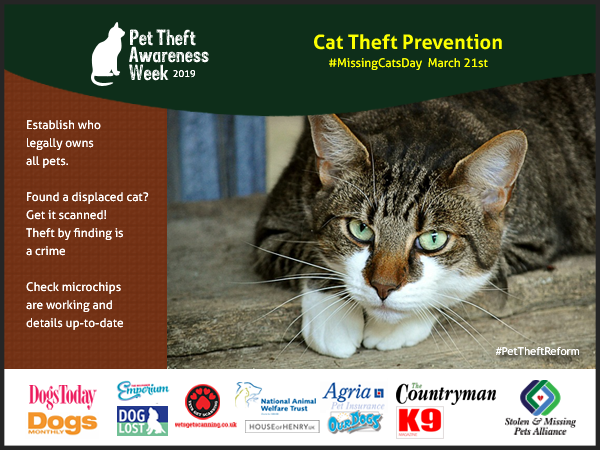 Please mention Pet Theft Awareness or SAMPA if using any content. Councils need to STOP throwing away our pets! The Pet Scanning Scandal! Most pet owners are shocked to find out that many councils are simply disposing of traffic accident pets WITHOUT a simple scan to inform the owners. Imagine the heartache of someone searching for a pet which the council have not bothered to scan. A one minute scan can halt a lifetime of searching. Heléna Abrahams is campaigning with her petition on behalf of millions of pet owners after her cat, Gizmo, became an RTA victim and was not scanned. Her petition has implications for cat and dog owners. If it reaches 100,000 then the government is required to look into the issue and hopefully hold a debate. Time is running out and we NEED everyone to help get the target before the end of March. We need over a thousand signatures per day so PLEASE get signing and sharing.